On April 21, 2018, South Meck Baseball will host our 6th Annual Fundraiser to raise money for the Miracle League. 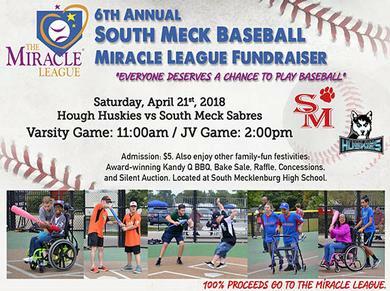 The South Meck Sabres will take on the Hough High School Huskies (Varsity at 11am, and JV game at 2pm) for a fun-filled day of baseball, BBQ, bake sale, raffle, concessions and a silent auction. The YMCA of Greater Charlotte and Miracle League have teamed up to give children with special needs a chance to play baseball through the YMCA Miracle League of Greater Charlotte.The Miracle League is an organization that provides an environment specially made for mentally- and physically-challenged kids to play the wonderful game of baseball. They have a special field that can accommodate wheel chairs, crutches, or any need the participant may have. The kids get to experience the game and for the time during the game, the parents get to sit in the stands and watch their kids participate and cheer them on. We are fortunate to have one of these fields at the University YMCA. ALL money raised will go to the Miracle League. The cost is $5 to get in. In the past we have raised $5000 to $10,000 at each of our fundraisers!!! It a great chance to give back to our community in a family-fun event. We believe that “Everyone deserves a chance to play baseball”. If you would like to make a donation to The Miracle League, please make your check payable to: South Mecklenburg Booster Club (please include “Baseball Team/Miracle League” on your check. Mail your check to: South Mecklenburg High School, Attention: Brian Hoop, 8900 Park Road, Charlotte, North Carolina 28210.